Hello and welcome to Imagine….a mobile disco with a difference! 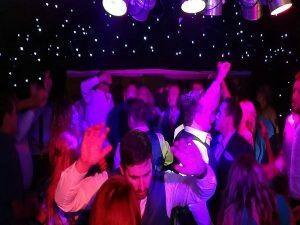 With a pride and passion for everything I do, and a proven history of providing outstanding wedding and party disco entertainment, I’d love to be a part of your celebration! When you hire me to provide your disco entertainment, the emphasis is definitely on creating fun and memories that last long after the final song of the night! Your party should be fun and enjoyable, and that’s exactly what I set out to achieve each and every time I take the disco out on the road. Can’t thank you enough for helping out with everything it was perfect. You can tell straight away that Wayne is very passionate about what he does and that results in a fantastic service that he provides. Most of my bookings come from word of mouth recommendations from previous customers, their guests, and venues I’ve worked in, and that’s something I’m REALLY proud of because it means I’m doing my job right! Why not have a look at what some of my previous customers have said about THEIR function, see the details of previous parties in my blog, and have a look at the gallery. If you have any questions no matter how big or small they may seem…..give me a call! I’m more than happy to talk about any specific requirements you might have for your party entertainment. Just wanted to say a HUGE thank you for your work at our wedding, everything was amazing and lots of guests have commented how good you were with regards to requests. Wayne, you’re an absolute star! Played the perfect selection of songs, kept us on track as our master of ceremonies and lit up the venue beautifully. Had an absolutely amazing day. Wayne did a great job and did everything we asked of him. He’s a great guy and I would definitely recommend him.